The JPS team of 12 lineman professionals, have done their country proud, by earning first, second and third place awards in two events, in the 30th International Lineman Rodeo held in Kansas, USA, on Saturday October 19. The annual event, sees over 200 teams from electric utilities around the world, competing for dominance in team and individual events, such as the Pole Climb and Hurtman Rescue, among others. JPS Lineman, Orville Black, nicknamed "Mr. Ice" bagged the first place in the Apprentice Mystery Event. The event required the lineman to carry out tasks on insulators on overhead electrical wires - speedily and safely. Not only did Orville Black of JPS receive a perfect score, but he also accomplished his tasks in less than 5 minutes. And with Jamaicans being known for speed, JPS linemen Denton Williams and Orville Black, snatched the second and third place awards respectively, with times of 21.12 seconds and 21.40 seconds. The winning time for the Pole Climb was 21.06 seconds. The Lineman's Rodeo attracts the best linemen from around the world to compete in events based on traditional lineman tasks and skills. 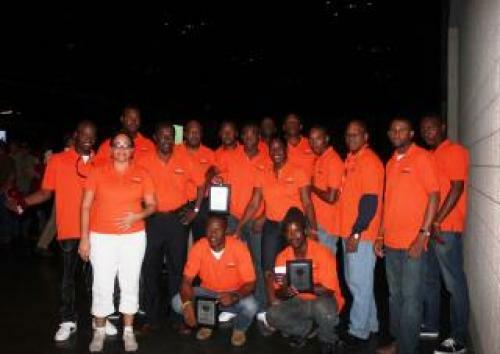 The contingent of JPS linemen return to Jamaica on Monday night October 21, arriving at the Norman Manley International Airport at 8:30 p.m.